Look to jazz greats like John Coltrane for insights into subatomic particles and the history of the cosmos. In this loosely autobiographical meditation, Alexander (Physics/Brown Univ.) 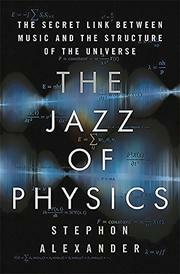 explores resonances between music and physics in Pythagoras’ “music of the spheres,” Albert Einstein’s love of music, Coltrane’s love of Einstein, and his own ideas as a theoretical physicist and jazz saxophonist. It’s a vast, cosmic theme that includes quantum mechanics, superstring theory, the Big Bang, the evolution of galaxies, and the process of scientific theorizing itself. Alexander mines music for analogies to physical reality and credits jam sessions as a method of opening his mind to scientific insights. The comparison between music and physics rests on the fact that sound is a wave with similarities to the wave phenomena that underlie modern physics. That observation sometimes yields illuminating results—e.g., the notion that the early universe contained tiny density fluctuations that looked like 300,000-light-year-long sound waves and eventually clumped into stars and galaxies. Unfortunately, Alexander rarely finds a satisfying middle ground between facile metaphor—“in jazz combos, the ‘gravitational’ pull comes from the bass and drums”—and obscure arcana. Most of the discussions (and the accompanying diagrams and math equations) are rapturous but murky. Many are too difficult and sketchily explained for laypeople to grasp, whether they are about physics—“D-branes were the objects that carried the Ramond-Ramond charge the same way a point particle (0-brane) carries electric charge”—music theory (“in the key of C, the V is a G-dominant chord and its mirror image/tritone for G is D-flat dominant”), or the effusions of jazzman Sonny Rollins (“I don’t want to play the music; I want the music to play me”). Alexander’s enthusiasm for his subject is infectious, but that won’t help readers fully understand it. A physics-for-poets guide that’s more exuberant than enlightening.